Are the Wrong People in Solitary Confinement? The poisoned or the poisoners? When we develop MCS/ES, we are told to avoid the triggers that disable us. Yet, far too often, fragrance chemicals are the biggest triggers of disabling effects, yet they are in everything, and everywhere now. 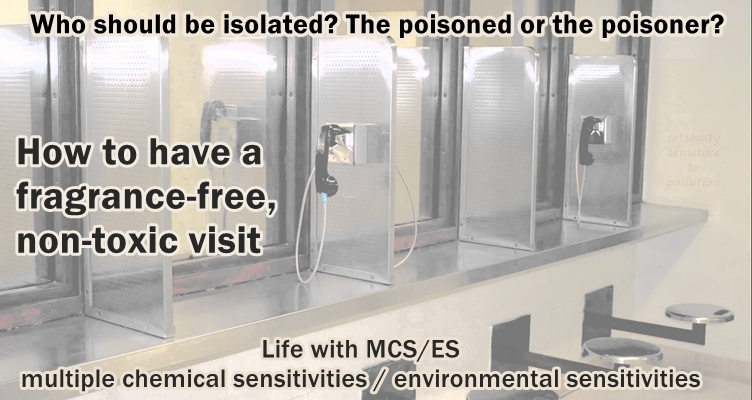 To follow doctors orders, and to have some quality of life (like the ability to look after ourselves), when others at work or elsewhere won’t stop using toxic products, we have to stay isolated in our homes (if we’ve found a safe one). It’s just like being in prison… but for crimes we did not commit. WE who are immediately disabled by these harmful pollutants are being forced into prisons of isolation for crimes the chemical and fragrance industry are committing, like when they hide oil and gas industry toxic waste chemicals into everyday products and materials, without listing them on labels, they are causing a public health crisis, a crisis that most people are unaware of. Note the use of easy to keep clean and non-toxic stainless steel features, the glass panels that keep toxic VOCs in the air from passing through, and the landline phones that eliminate wireless radiation exposure. This entry was posted in Accessibility, Air Quality, Chemicals, Environmental Health, Toxic Trespass and tagged allergies, asthma, barriers, cancer, chemical sensitivity, environmental sensitivities, fibromyalgia, Fragrance, fragrance chemicals, hazardous air pollutants, IAQ, isolation, MCS, MCS housing, petrochemicals, prison, segregation, sensitivities, systemic barriers. Bookmark the permalink. Hi, there! I loved your most recent blog about fragrances. I tried to post a comment on the blog, but I had trouble logging in to WordPress. Yes! Fragrances are so poisonous these days. A week ago Sunday, I went to church. I was a couple minutes late and everyone was already in the chapel, yet the air was so thick with fragrances that I immediately had a reaction. I got worse every day. By Wednesday, my doctor prescribed Prednisone and Tessalon. I shouldn’t have to take these kinds of medication just because I want to worship. It takes weeks to recover – sometimes months. I didn’t go to church yesterday, but I talked to the highest local church leader about my serious health problem. Well, I had to whisper (lost my voice) and pause in the middle of my sentences because of my shortness of breath. He is going to make sure there is a notice in the Sunday bulletin that asks people to refrain from wearing fragrances to church. I live in a very small community and people here are stubborn about being educated about MCS. It’s so frustrating! You managed to get through the wordpress hoops to leave this comment and what you say is appropriate here too. I really hope the people in your church are able to understand that there is no way Jesus would choose products over people! The products are hurting them too, as well as poisoning the air and water we all depend on for life. Let’s hope they realize this quickly, and do the right thing soon! Great posts both for educating those about the issues but also for showing alternatives. People using toxic chemicals often focus on what they are giving up. If only they could see that they are substituting healthy for unhealthy choices and that their’s and our quality of life would improve. I am not able to attend church anymore. The products are so strong and travel in the air such distances. There is no safe place to sit. I’ve had to leave the last few times I’ve tried. Instant migraine, burning mouth, palpitations, sore throat…..all get flared and I’m sick for several days afterward. It’s really a shame to have to give up my spiritual fellowship because of toxic products the public is not aware they’re using because of Trade Secret Laws that protect manufacturers from having to disclose ingredients. Our rights to clean air and water have been stripped from us. Life, liberty and the pursuit of happiness…. except if you have been rendered chemically sensitive and disabled by no fault of your own. More of us need to file Human Rights complaints. The Canadian Human Rights Commission has both a legal and medical position on MCS as a recognized disability. That means we must be accommodated in a way that is inclusive NOT exclusive or isolating. All the provincial Human Rights organizations follow the CHR tribunal decisions. A suggestion for a very useful article would be one where MCS sufferers are informed about the right to a scent free environment under our Canadian constitution (and lesser legislation) and what the process might be. I have long thought that we should band together and file a group lawsuit to have scented products banned from public spaces and workplaces. Wear what you want in the privacy of your bedroom but leave public spaces free of substances that are harmful to many people. Good use of the image there. So many of us are getting so sick from environmental pollution – fragrance, car pollution and industrial pollution. People in Asia are dying from exposure to pollution. When will there be a shift in governmental policy to protect us from this toxic reality? We definitely need a legal right to a healthy environment, and the right to pollute it and us for profit needs to be revoked… plus, we need to start respecting and caring for our life support system, as this planet cannot keep us alive much longer if we don’t clean up our acts and start nurturing and restoring what we’ve destroyed. Maybe it’s not the ‘wrong’ people this happens to but the ‘right’ or righteous ones who are able to discern ‘The Truth’ and protect themselves as well as they can from those ‘tresspassing against us’??? It was a very hard summer. So many more people are being affected, but they don’t or can’t believe how bad it can get, and how little they will be able to do when it does get bad, (we all believed there would be help, that no-one would subject anyone to life like this) so they don’t get pro-active re getting policies changed while they can. The toxic economy has to stop and an economy based on environmental (which includes us) health, well-being, and future generations needs to take its place. My hope now is that enough people become aware of the causes and effects of their declining health and abilities while they can still push for policy changes that would protect not just us, but future generations as well.